Name the one quality that can take you to the top and keep you there! The answer is character — the collection of qualities synonymous with greatness. Character is a quality that embodies many important traits, such as integrity, courage, perseverance, confidence, and wisdom. The amazing thing about character is that, if you’re sincerely committed to making yourself into the person you want to be, you’ll not only create those qualities, you’ll strengthen them and recreate them in abundance, even as you’re drawing on them every day of your life. When you have character, you’re a person of substance... and you truly deserve the personal and professional success you’ll attain. Name the one quality that can take you to the top and keep you there! According to Jim Rohn, the answer is character — the collection of qualities synonymous with greatness. When you have character, you’re a person of substance .. and you truly deserve the personal and professional success you’ll attain. 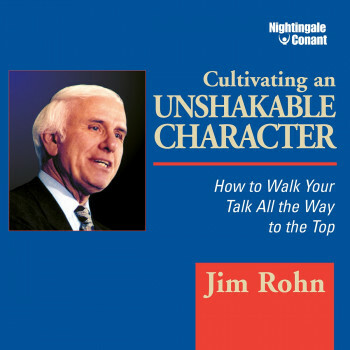 Cultivating An Unshakable Character by Jim Rohn is a spellbinding program in which you’ll uncover the 12 pillars of character that form the indestructible foundation for personal and professional success. Discover how to develop uncommon courage, why it pays to adopt a “the-buck-stops-here” attitude, and how to make yourself a more confident leader.